For the young at heart, the wishing well has always had an enchanted place in our imagination. 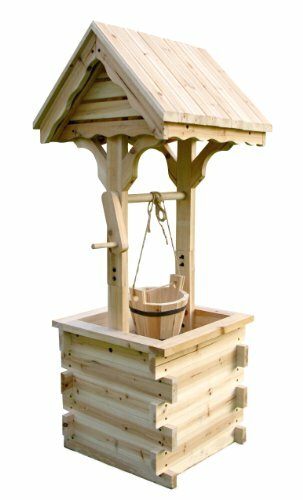 Our beautifully handcrafted wishing well will fill your garden with a sense of fun, adventure and charm. Made of high quality yellow Cedar wood known for its natural resistance to moisture, decay and insect damage. All containers have a drainage hole for direct planting. Roof 16.5"; Inner planter 12.5"; Planter Height: 6-12.5-x.top dim: 19" x 19"; Outer planter dim: 16.5" x 50"H; Total Height: 48"
If you have any questions about this product by Shine Company Inc., contact us by completing and submitting the form below. If you are looking for a specif part number, please include it with your message.